Ekamai offers Thai comfort food and friendly service in a welcoming atmosphere. A fast and fresh take-out restaurant that defies the standard mold of the Utah Thai scene, Ekamai Thai offers a fresh interpretation of modern Thai cooking—and the culture that goes with it. In what feels like a cheerful trip to Sesame Street with all the industrial-chic urban appeal of a Greenwich Village bistro, plus friendly proprietors who know everyone by name, Ekamai (éh-kah-my), on 300 South and across from Pioneer Park, is nestled in what is fast becoming the bohemian center of Salt Lake City. Overseen by the ever-hip 30-year-old Woot Pongsawan (pictured), Ekamai flawlessly delivers the tried-and-true Thai dishes Americans love, while gradually coaxing them closer to a more international authenticity that is modern Thai cuisine. “People come here, they like the food, they like me and they tell their friends,” Pongsawan says. And you really will like him. 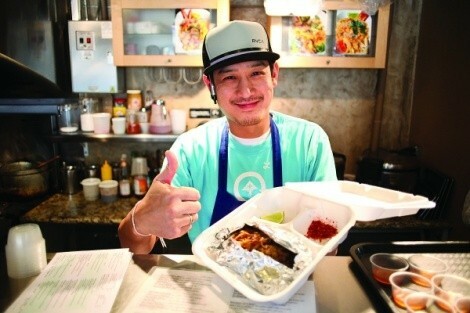 With a personality as authentic as his food, Pongsawan gets to know his customers as he would a close friend. Diners can expect to be warmly greeted and attended to in a way that feels utterly genuine. It works, too, because the food is so good. There are the mainstay favorites of mussaman and yellow curry, which hold their own in a well-established Thai food milieu. But it’s the dishes that pop up on different days of the week that are really worth looking forward to, as well as the made-upon-request Drunken Noodle. Just get it; you won’t regret it. All the recipes are created by Pongsawan and his wife, O, who plan to add more traditional recipes on a gradual basis. Their formula proves that the simple brilliance of Thai comfort cuisine in a casual atmosphere is a winning combination. “We try to make it easy, you know, a fun place,” Pongsawan says. And with a mouth too full of mango sticky rice to say anything, I nod in agreement.